It is not uncommon for people to find themselves in a financial situation where they have to file bankruptcy. It is possible for them to also be involved in a personal injury case during this time. People need to understand it is likely their personal injury lawsuit will impact their bankruptcy case. This is a legal term to describe a person requesting protection from creditors in a bankruptcy court. With Chapter 7 bankruptcy, everything a person owns as well as owes is listed on a bankruptcy schedule. It is then submitted to the bankruptcy court. All their assets can be liquidated or sold by a trustee assigned by the court to pay the outstanding debts. A person can also file Chapter 13. This is done when they are trying to get a reorganization of the repayment plans they have with creditors. A bankruptcy court’s decision will be based on a person’s income and assets. It is possible for a person to keep the money they receive from an injury settlement or judgment if they are in bankruptcy. They may be able to keep up to $10,000. Personal injury claims can be exempt from liquidation up to this amount. Any money or assets awarded after this amount has been reached may be required to be paid to the bankruptcy case. Should the settlement or judgment amount be more than the debt in a person’s bankruptcy, they will get to keep what is left over after all their creditors have been paid. 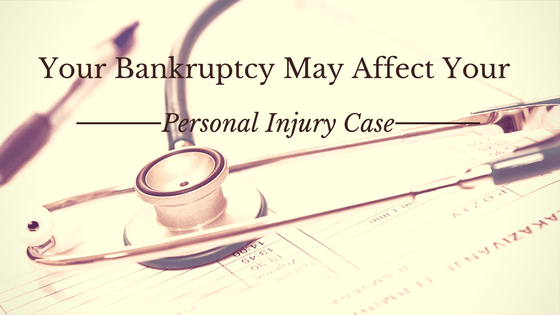 Once a person files for bankruptcy, a personal injury case will stop. This is known as an automatic stay. Should one side of the personal injury lawsuit want to continue the case, even when the other side has filed bankruptcy; a request must be made to the court. This will require submitting a motion to lift the stay. It will only be granted if good cause is shown to the court. It has been granted in situations where an insurance company agreed to cover a loss and doing this did not impact an estate. It is unlikely a person’s case would enable them to recover anything against a defendant in excess of insurance coverage and more. If the automatic stay is violated, the offending attorney and their client could be subjected to sanctions as well as other types of damages. When a person is seeking legal representation for bankruptcy; they must disclose any pending lawsuit with the attorney who will represent them. The reason for this is a person filing bankruptcy must disclose all of their assets. The more information provided to an attorney makes it easier for them to develop an effective legal strategy. The goal will be for a person to retain as much of the settlement or judgment award they receive as possible. It is possible for a person to file for bankruptcy and not disclose their personal injury lawsuit. If the bankruptcy is not closed, it may be possible to amend the schedule and disclose the lawsuit. If the bankruptcy case has been closed, it may still be possible to amend the bankruptcy schedule and disclose the lawsuit. This can happen when a debtor from a bankruptcy case attempts to recover an asset that was not disclosed in a bankruptcy schedule. Should a bankruptcy schedule not be amended prior to summary judgment; judicial estoppel could apply. When a bankruptcy case is dismissed, the bankruptcy case is gone and so is bankruptcy protection. All the assets of the bankruptcy are given back to the debtor. Should a person be suing the debtor for a personal injury case, it can proceed once a dismissal has been granted.